Note: Click on thumbnails for full-size pictures. A couple of days ago, I watched a re-run episode of NOVA (in high definition) that had a fairly long segment on the late-October 2006 X Prize Cup space elevator climber competition. As readers of this blog may know, I made the trip out to the Las Cruces, New Mexico International Airport for the Cup, so it was nice to see "objective" footage about it. I had a very good time at the Cup, and it was great to see real hardware, but it took a while to get used to the events and displays on offer. Everything at the Cup was a reflection of where much of the alt.space industry stands today -- tremendously exciting and interesting, but not very well organized or well rounded. 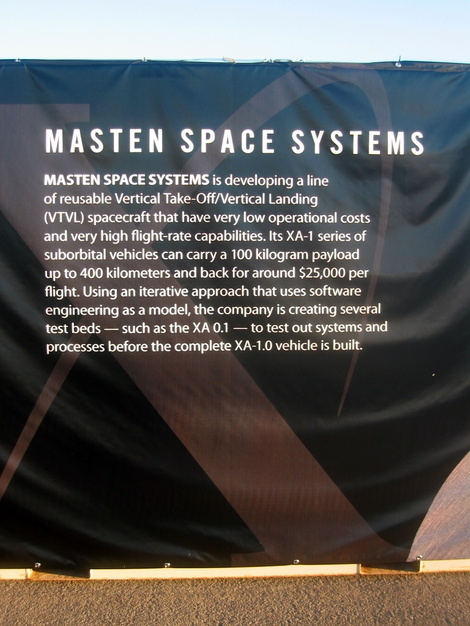 There were a handful of alt.space companies displaying hardware, such as Armadillo Aerospace, Masten Space Systems, and XCOR Aerospace. 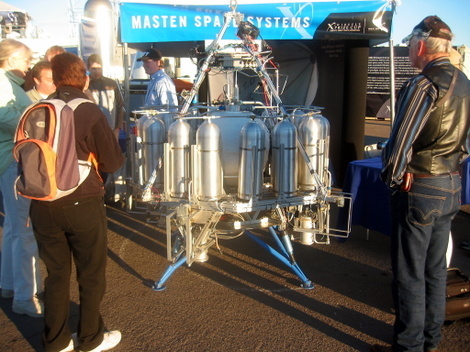 I was able to meet and talk briefly with Jon Goff, lead engineer of Masten Space Systems. By way of background, I have known of Jon for several years, due to the content that he published on the web when he was still a student at BYU, and his later postings to his blog at Selenian Boondocks. Jon is a great guy and an asset to the 30-something generation of "practical dreamers." Masten's vehicle in the morning sun. The Cup seemed disorganized and sort of thrown together at the last minute -- not surprising considering that this was the first X Prize Cup -- but there were several nice touches to promote the alt.space industry, such as informative signs on the side of containers that had been used to transport everything to Las Cruces. Masten's sign on the side of a container near its display. It was nice to see that the Armadillo Aerospace team was very outgoing with those who attended the Cup, even while in the midst of long days of competition to win the Lunar Lander Challenge. For several hours, the whole team gladhanded and answered questions from the crowd. It was a shame that I didn't have any good questions prepared for the occasion, because the team was tremendously open and honest. All of the folks at Armadillo are my heroes for the step-wise approach that they are taking to vehicle development, even though they didn't win the Lunar Lander Challenge this year. Armadillo preps Pixel, one of two vehicles that it brought to the Cup for the Lunar Lander Challenge. In the picture below, you can see the crane truck that was used to transport Pixel for its run at the Lunar Lander Challenge. The Challenge was one of the highlights of the Cup. Armadillo's run was great in filling the down time between events. The Lunar Lander Challenge flights were held in the far distance. I thought that the flights should have been more "front and center" and closer to the crowd. 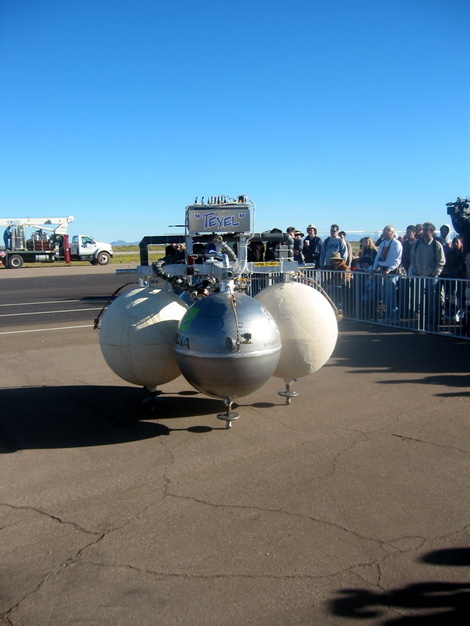 Armadillo Aerospace's Texel vehicle, one of two vehicles prepared for the Lunar Lander Challenge. Another highlight of the Cup was the small rocket launches from Tripoli Rocketry Association. 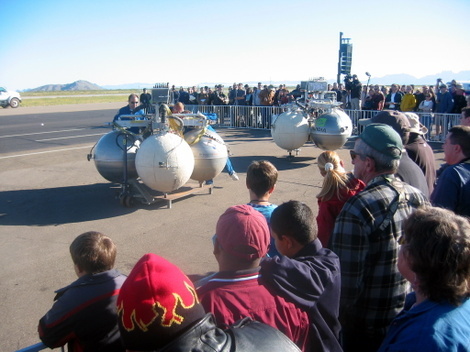 Even though the rocket launches were far away from the crowd, they were loud enough to be crowd pleasers. The crowd was ooh-ing and ahh-ing at the launches and I think that there should have been been many more of them. Less interesting to me were the events that didn't have anything to do with getting to space, such as military jet flyovers, rocket belts, and rocket bikes. Sometimes the space-related events were held up due to non-space-related events, which didn't make sense to me. This is something to keep in mind, as the Rocket Racing League is contemplated as a future part of the Cup. 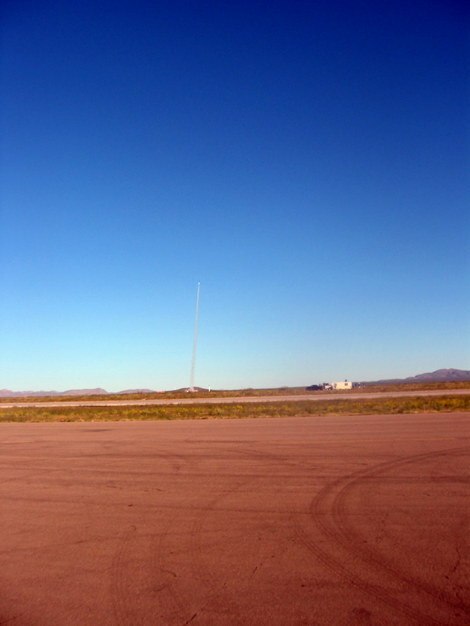 A Tripoli Rocketry Association small rocket launch. I would have liked to have seen SpaceX, Bigelow Aerospace, and Blue Origin participate in a similar fashion to Google Earth. Maybe they will participate next year. It felt that alt.space wasn't totally represented and that old space was overrepresented. There was too much NASA and too much Northrop Grumman, although I fully recognize that you have to tip your cap once in a while to your sponsors. NASA did have the impressive Space Shuttle Main Engine on display. 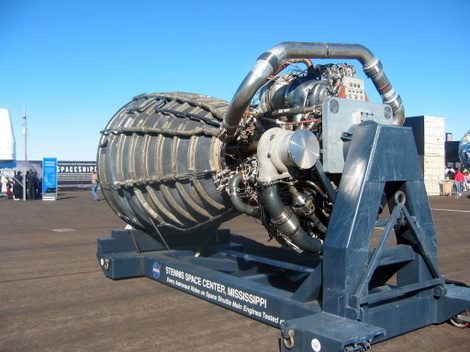 A Space Shuttle Main Engine on display at the 2006 X Prize Cup. Back to space elevators. To be honest, I am not sure whether there will ever be a suitable tether material for a space elevator, but the climber challenge at the Cup was very fun to watch. As the days wore on, I gravitated toward the competition, because that's where all the action was happening. The vibe at the climber challenge was a lot different than the rocketry-focused events of the Cup. The participants mostly were affiliated with universities and each entrant had at least a slightly unique approach. Some of the teams were trying several different approaches on-the-fly. All of the teams were very approachable. I talked with a University of Michigan team member who said that Lockheed Martin had provided them with a high efficiency solar panel normally used for satellites. Apparently, it wasn't a perfect panel and therefore couldn't be used on a satellite for a paying customer. It took a long time for the competition to progress, so I would have wished for grandstands with a little shade. As stated in other posts, the New Mexico sun is brutal and there were few places to sit and casually watch. Also, I think that they should have had more than one tether so that there was more action going on at one time. The Cup had a VIP pavilion sponsored by Red Bull to which I purchased a ticket. Food and drinks were served. It proved decreasingly of use to me as the Cup wore on, but I viewed the ticket as more of a way to support the Cup. I did get to meet the Ansari family at the pavilion, who described making the trip to Kazakhstan to watch their sister Anousheh's launch to visit the International Space Station. They are from the D.C. area, so we had plenty to talk about. Overall, I had a really good time at the Cup and would recommend it to others. As the X Prize Foundation gains more experience with these events, I am sure that they will become more organized and more well-rounded. Probably, I will get the time off work to do it again next year. That's a shuttle main engine... not a J-2. Oops. So it is. I could have sworn it had a J2 sign on it, but it clearly says Space Shuttle Main Engine.